Your times and seasons are in My hands, says the LORD. I cannot be rushed. I Am preparing you, and planning way ahead of you, for I know the way that you take. It is new territory for you, but not for me. I will remove the obstacles and foil the enemy’s diabolical plots against you. For the enemy cannot predict the future and cannot dictate your present life. 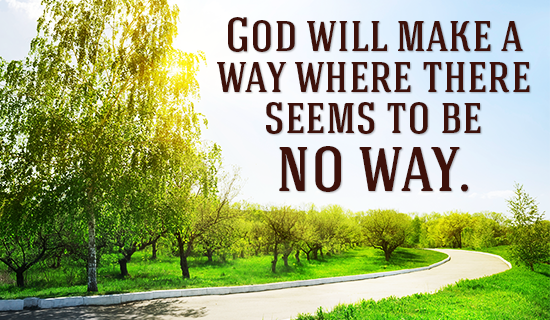 I Am the LORD, and I will prepare the way for you, and create a way where there is none, says the LORD. Entrust your life to Me, for then you will have peace, says the LORD. For the rest that you will have will be evident, as you stop trying to make things happen, and let ME do it. I will order every step, and give you peace in the process, as I set the pace, and clear the path for you. My will shall be done, and although you believe you can be deterred and delayed by unexpected circumstances, it will not be so. I Am an on-time GOD, and you will not be delayed or detained, either, but will be in the right place at the right time, to do what I have called you to do, precisely on schedule, says the LORD. Amen, though page not found again..
I’m getting same thing! Page not found!! I love your posts Prophetic Light but your links don’t work anymore.